19th century likely Continental bronze and champleve enamel table box purchased at the sale at Belinda Gentle's home after her death in 2005. She was an internationally famous antique dealer and author of the main texts on antique metalwork. Her husband Rupert, was the author of Domestic Metalwork, the authoritative book on the subject, which she updated and revised after his death. The Belinda Gentle metalware gallery at the Victoria and Albert Museum in London is named after her. She was a lifetime student and dealer in antique brass and associated metalwork. This was purchased from her personal collection in her home in 2005 when she died. See also the gilt eagle on stand for another listing from her collection purchased at that sale. It is a large and strikingly lovely table box with aesthetic scrolled designs in enamel to the four panels on the hinged top and above each leg. Size-6.25 inches wide by 4.5 inches deep by 3.5 inches high. In very good original condition, with a wonderful patina to the bronze, this would be an beautiful decorative accessory, or most useful on a desk or dressing table. 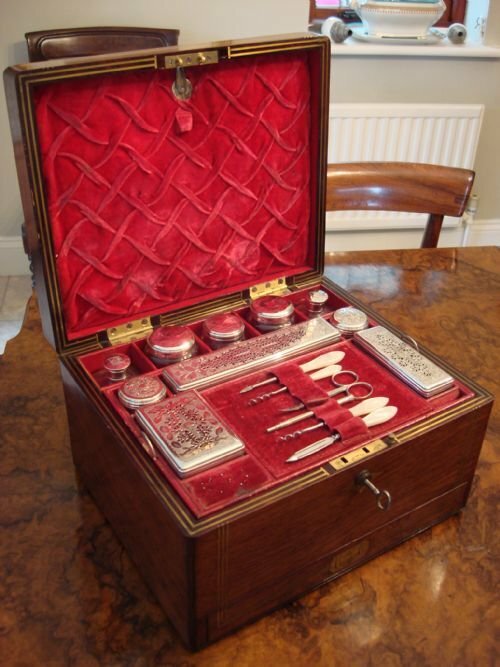 Superb rosewood and brass inlaid travelling dressing case with interior fittings and working Bramah lock and key. 19th century, circa 1850, beautiful and generously sized rosewood rectangular travelling vanity or dressing case with lovely brass inlay to both exterior and interior, and including a complete fitted interior plus secured lower drawer. These were used to carry personal items such as toiletries, jewellery, and writing implements, the essential things a person travelling in the 19th century would need. An unusual box, in beautifully grained rosewood , with shaped brass cartouche to the rising lid, bearing an unusual family crest. There is also a flush fit drawer bearing a recessed military style handle, that for security can only be accessed when the lid is opened, and a pin is removed. The working lock and key is for a Bramah lock, the most secure and expensive lock, only fitted on the highest quality boxes, and fortunately the original key has been retained. 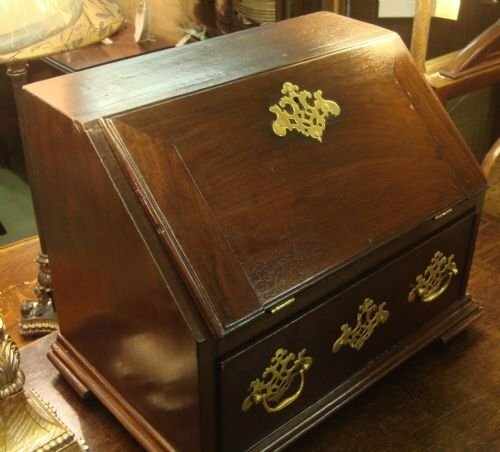 There is a very elegant triple band of brass line inlay to both the front and top of the box. 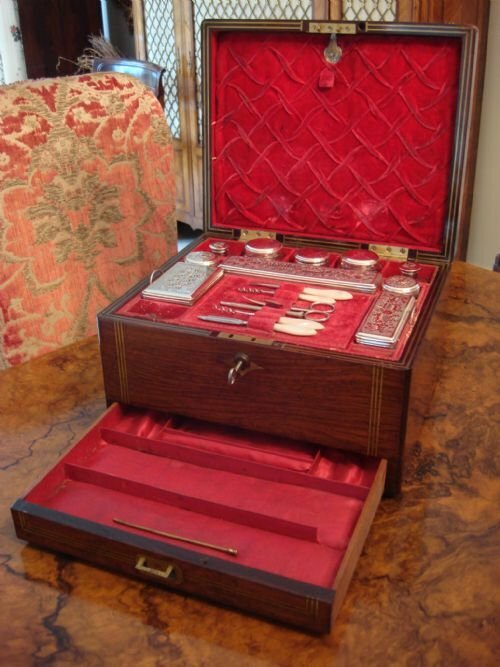 The interior opens to reveal a red velvet lined case with double lined brass inlay to both the lid and box edges. The lid compartment lowers to reveal the original mirror with foxed glass. 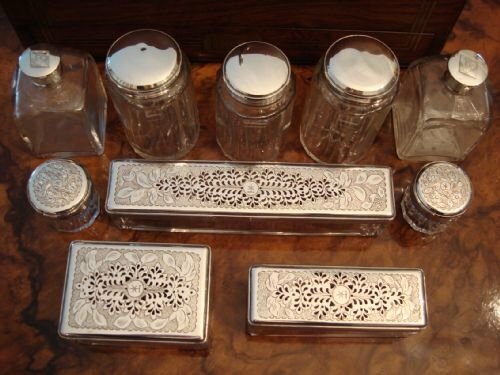 The top interior compartment is divided, and holds a total of 10 beautiful cut glass bottles, 7 having a family crest, all with very good quality silver plated tops. 5 have plain lids, while the rest have a combination of bright and matt foliate and leaf engraved lids. All the cylindrical bottles have panel cut sides, faceted shoulders, and star cut bases. The two large square scent bottles have faceted shoulders as well, and retain their interior cut glass stoppers. The rectangular jars have pierced tops for ventilation. In addition, there is a built in pin cushion, and a set of mother of pearl handled tools including manicure tools, corkscrews, and a propelling pencil. The top tray removes to reveal a large empty storage compartment below. The manicure set also lifts up to reveal divided silk lined storage below. The lower flush fitted secure drawer (can only be accessed when box is open and pin removed) is also silk lined and divided to store jewellery. A stunning box, and generous in size. It is a lovely size to use and display as a jewellery and scent box, and would make a great gift. Size-12 inches long by 10 inches wide by 7 inches high. Condition is very good overall, with just some minor bumps to two of the plain silver plate tops, and foxing on the original mirror glass. A superb quality box for the box collector, with working Bramah lock and key. It is also a functional piece to use or to give as a gift. 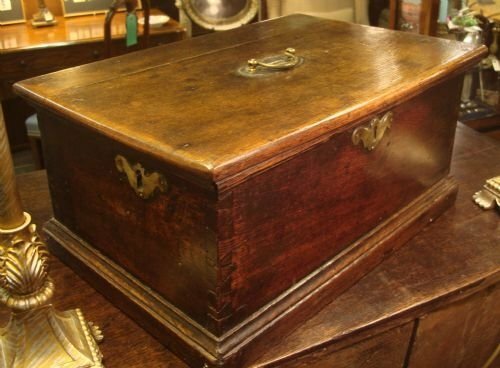 Circa 1720, early 18th century rare George I solid oak rent box having three locks, and coin slot. Circa 1720 very rare George I solid oak rectangular rent box with brass handled iron coin slot to rising lid, and three locks, one on each side, and the front, with lovely brass escutcheons to each. Also with iron hinges. 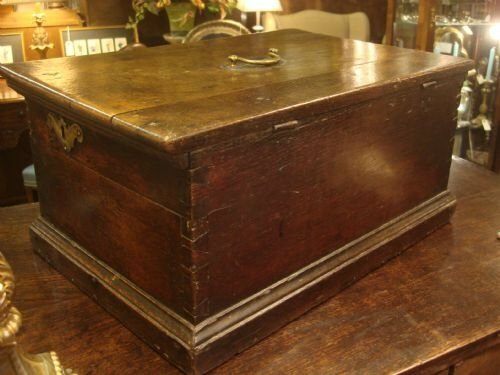 A very interesting survivor of the Georgian period, this box also has moulded edge to top, and to the plinth base. Size-19 inches long by 12.75 inches deep by 9 inches high. With excellent colour and patination, this is a great box for the collector, as well as a wonderful decorative accent to use in any room, to contain special objects. In very good condition, and nearly 300 years old! A unique piece. 19th century stunning solid mahogany table cabinet with fall front, fitted interior and 3 secret drawers. Wonderful and unusual 19th century solid mahogany table cabinet with moulded edged fall front enclosing three pigeon holes with shaped dividers over 3 interior drawers. The two interior side drawers have secret drawers behind each one. The top lies over a deep drawer, having another large secret drawer that slides out from the back of the large drawer bottom. All the fittings lock and hinges are beautifully patinated brass, and the cabinet also has a high quality three point lock (no key). 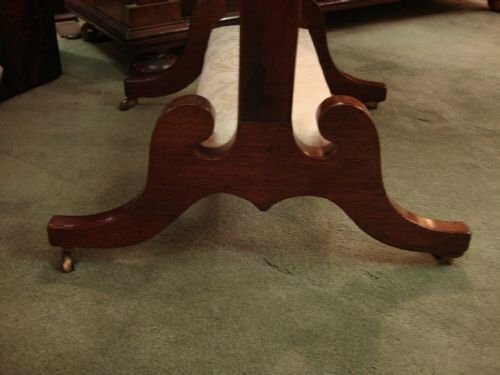 The whole stands on shaped bracket feet with moulded edge above. Size-18.5 inches long by 12 inches deep by 14.25 inches high. The fall front when open makes the cabinet depth 19 3/8 inches deep. A most unusual and very attractive table cabinet with great colour and patina, and in very good condition. This is perfect for desk or table, to store many things as well as valuables. When I purchased it, it was housing a collection of miniature books, for example. A most decorative and collectable piece, and a great talking point. 19th century Georgian walnut and mahogany antique paint box. 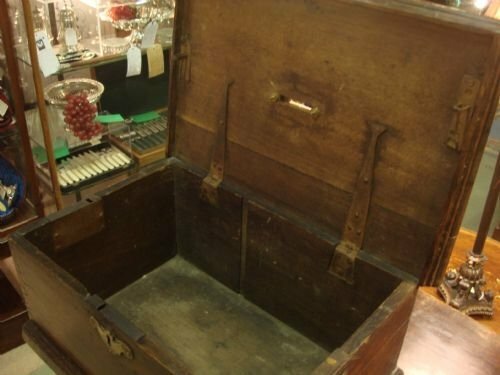 From a large home in Sussex, with many family antiques, a 19th century Georgian mahogany and walnut inlaid antique paint box/work box having a rising lid with fitted interior containing lidded velvet lined compartments with ivory knobs above a removable leather topped writing slope, containing a slide out pen tray and ink drawer including original cast brass topped inkwells. 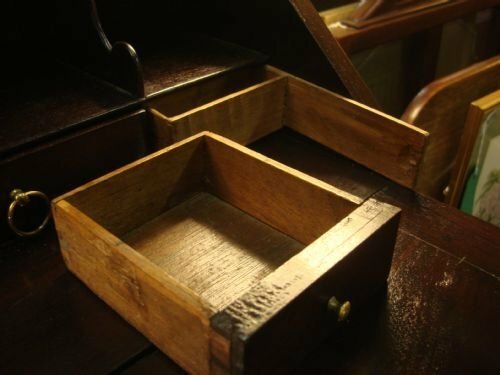 A fitted drawer is found next to writing slope. The middle largest compartment also lifts out to reveal another similar compartment below. 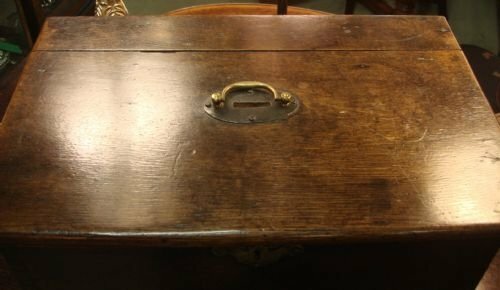 Fine dove tail construction, original brass fittings, ivory escutcheon, and the original lock and key complete the chest. 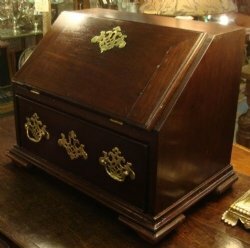 A very unusual, beautifully crafted and complete antique Georgian chest, very suitable for jewellery, watches or any small items. This would probably have been a bespoke chest, originally made to house paints, and would have been very expensive when made. Size-16 inches wide by 11 inches deep by 7 inches high (closed). Circa 1815 Regency period stunning campaign type vanity box or dressing case in superb rosewood box. 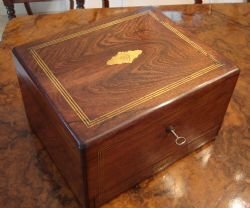 Circa 1815 Regency period rosewood campaign type fitted vanity box or travelling dressing case, with wonderful brass embellished box having a secret jewellery drawer to base, and very nice interior contents. 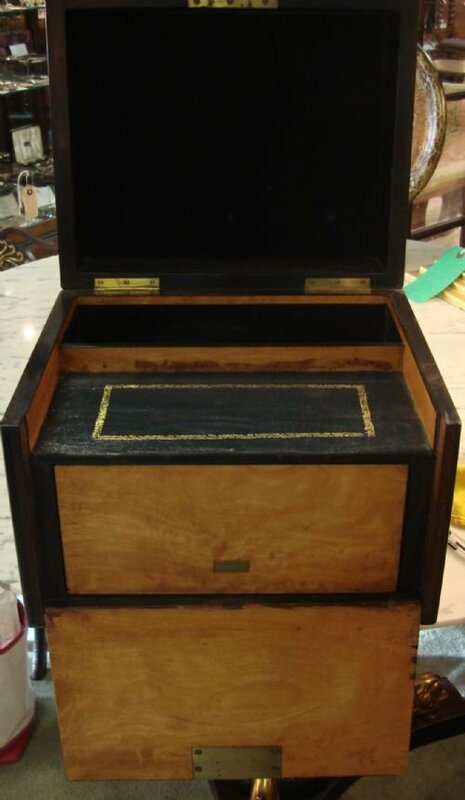 The box has brass corners to all corners, recessed carrying handle to top; recessed handle to secret drawer below, brass escutcheon and strap work to middle of each side. They set off the handsome grain of the rosewood beautifully. The box has wonderful colour and patina. 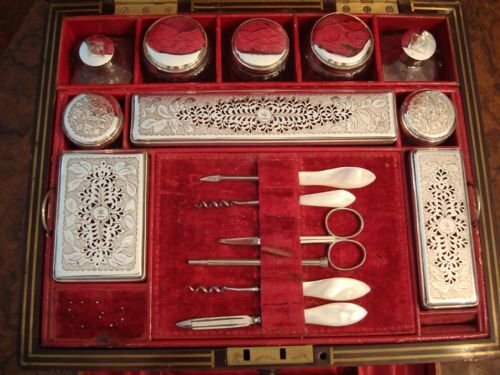 The striking red leather lined gilt embellished interior includes 4 cut glass silver plate topped panel cut jars with faceted shoulders and star cut bases, a pair of steel scissors, an ivory handled tweezers and ivory handled cork screw. Also including 4 covered compartments (two of the compartments and their lids are lead lined), and a secret jewellery drawer with dividers. 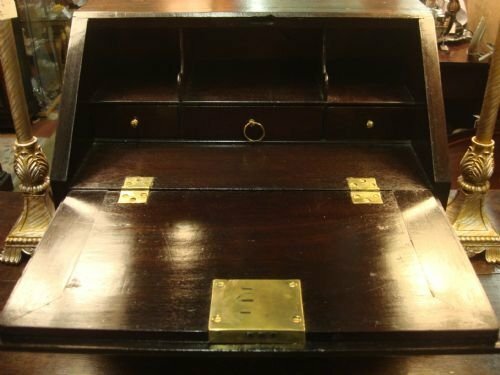 Behind the leather lined interior lid is a billet doux compartment to hide love letters, with a dressing mirror behind. The secret drawer handle is loose on one side. Overall, the condition of the box and interior contents is very good. The ivory handled tools are unusual and in great condition. It is unusual to get a cork screw in this type of box as well. This is a really lovely box for the collector to use and display or to give as a unique gift. It would make a wonderful jewellery box for either a man or a woman. 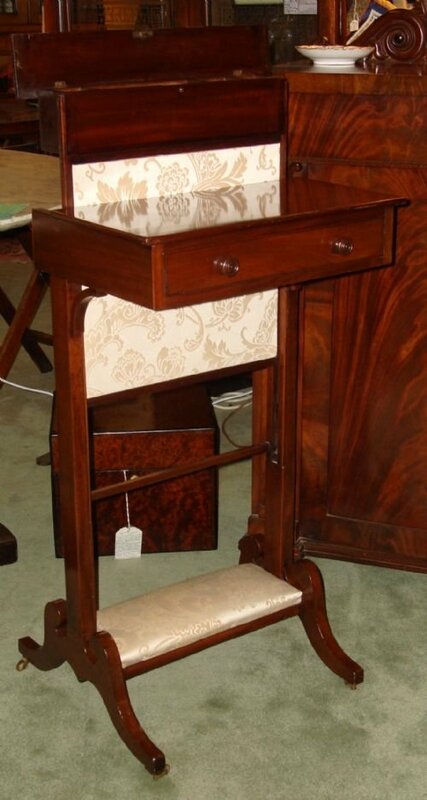 Very unusual 19th century solid mahogany writing box on stand with integrated fire screen and foot rest. Wonderful 19th century solid mahogany fitted writing box on stand with height adjustable built in firescreen and foot rest. 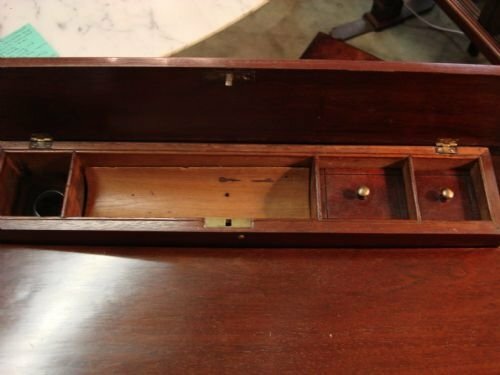 The fitted box with front pull out drawer has a rear hinged panel which opens with push button catch to reveal pen rest, glass inkwell, and two covered containers with original brass pulls. The rear section also lifts up at heights up to 14 inches, which raises the attached firescreen, which originally protected the users face from the fire. 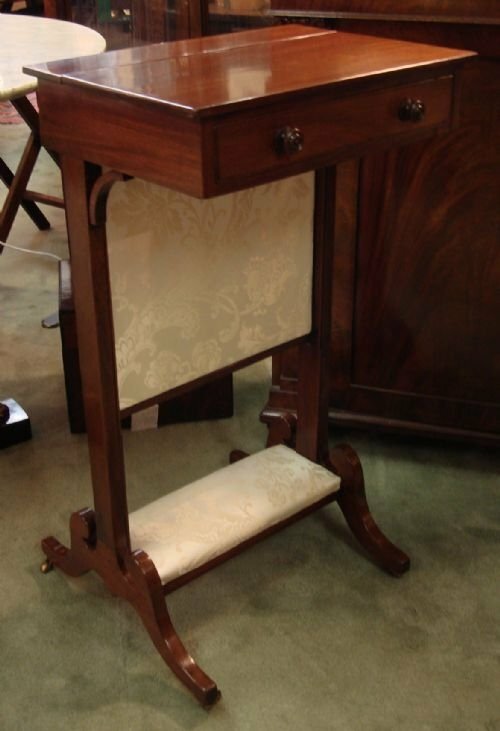 Both the firescreen and foot rest are covered with a cream damask fabric, and the box and stand are finished on all sides allowing it to be placed in room centre if desired. The whole stands on shaped and splayed feet with original brass castors. 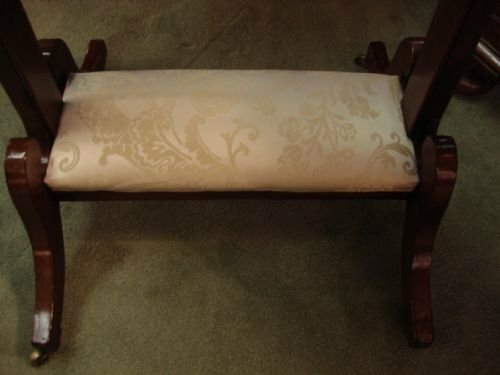 Size-17 inches long by 12.5 inches wide top, or 16.25 inches wide legs, by 31.5 inches high. Height of rear section of top lifts to raise to further adjustable heights. A very unusual box on stand in very good condition. 19th century large impressive exotic and rare amboyna wood superior quality cigar box, lined with satinwood and fitted with a Bramah lock. These locks were only put on the finest pieces. Marked Chapman's patent #191 on brass plaque to interior. Brass inlaid vacant cartouche to lid, suitable to be engraved if desired. Beautifully finished inside and out. When the top dark blue velvet lined lid is raised, the front side drops down to reveal an unusual swing out brass pierced tray that both holds and offers a number of cigars for presentation and selection. 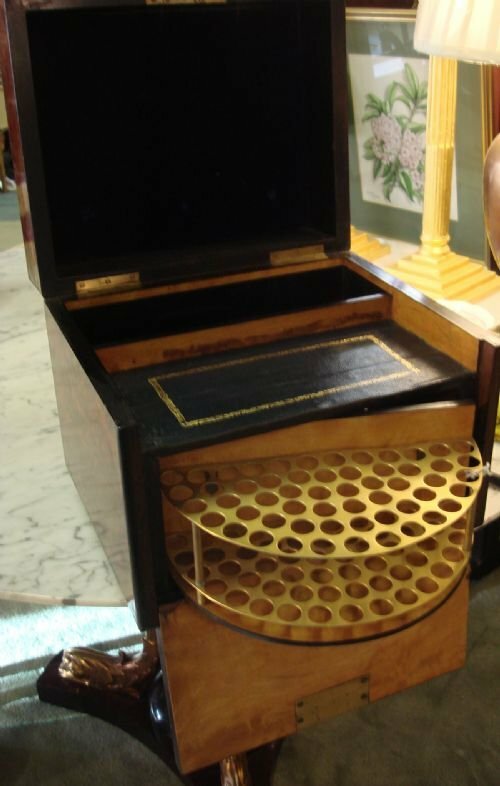 There is also a leather platform, useful for cutting the cigar end, or for resting a drink, and 3 divided velvet lined vertical compartments, to hold additional cigars or potentially small drink decanters. The whole stands on four brass ball feet. Wonderful craftsmanship, and a rare wood. A great piece in very good condition. A most unusual antique cigar box. Sure to impress. A wonderful gift for a gentleman, cigar enthusiast or collector of unusual boxes. 12.5 inches wide by 10.5 inches deep by 11 inches high. 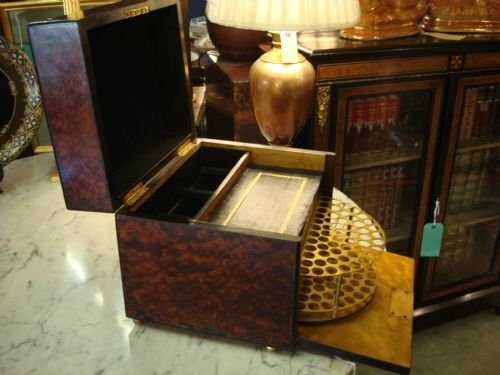 Please also see solid silver cigar boxes, and other accoutrements for the cigar aficionado. 19th century very handsome miniature Wellington chest of drawers. 19th century circa 1860 very striking miniature Wellington chest of drawers with original lock and key. Quite possibly an apprentice piece, this is crafted from several different woods; pine, ash and mahogany. With six graduated depth drawers, and beautiful curved pilasters to sides, the light and dark tones and striking wood grain make this a very handsome piece. Ebonised detail to front and on carved drawer pulls. The hinged pilasters lock, and when opened and folded back, allow drawer access. This is a very functional piece for use as a collectors cabinet, or to hold jewellery or make up, remote controls, keys or whatever one likes. It also makes a very attractive display. 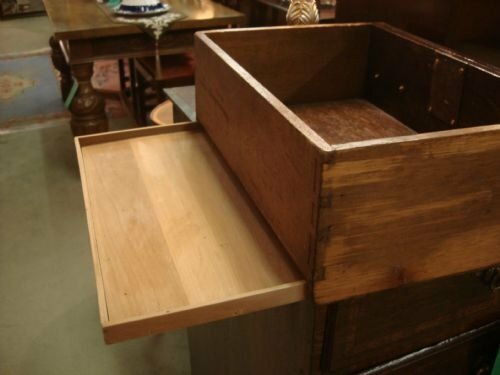 Very well made with fine handmade dove tailed joints to drawers. Size-17.75 inches high by 14 7/8 inches wide by 9.5 inches deep. A popular and collectable piece, not often found, which would appeal to both men and women. In very good condition, with lovely style, colour and patina. Will blend with any period of decor. Circa 1900 superb Arts and Crafts strikingly coloured painted oak casket attributed to Jessie Bayes RA. Circa 1900 Arts and Crafts period stunning painted oak casket, attributed to Jessie Bayes, of the renowned Bayes family of artists, brightly decorated with leaves, swirls and shields, on a red ground, and highlighted with gilt borders and plaques. It appears to be a three dimensional version of an illuminated page of a book. A most unusual antique box, possibly made to commemorate a marriage, as there are beautifully conjoined initials in the cartouche. Jessie was the sister of Gilbert Bayes, the famous sculptor. She was a member of and exhibited at the Royal Academy from the early 1900's, and was famous for her illuminated painting done in the Arts and Crafts style, particularly her gold work and heraldic decoration. She illuminated many books and even received some commissions to design stained glass. The entire box is beautifully painted, with heraldic decoration to the sides, very intricate borders, and a sarcophagus shaped lift off lid opening to reveal a plain oak interior. Size-10 inches long by 5.75 inches deep by 5.25 inches high. 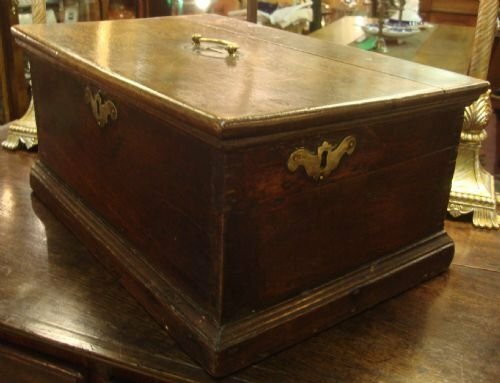 A most unusual and stunning box for the collector of antique boxes, to use or display. In very good condition, and truly one of a kind.